Of the multitude that has read her books, who has not known and deplored the tragedy of her family, her own most sad and untimely fate? Which of her readers has not become her friend? who that has known her books has not admired the artist’s noble English, the burning love of truth, the bravery, the simplicity, the indignation at wrong, the eager sympathy, the pious love and reverence, the passionate honor, so to speak, of the woman? I remember the trembling little frame, the little hand, the great honest eyes. An impetuous honesty seemed to me to characterize the woman. Twice I recollect she took me to task for what she held to be errors in doctrine. Once about Fielding we had a disputation. She spoke her mind out. She jumped too rapidly to conclusions. (I have smiled at one or two passages in the Biography in which my own disposition or behaviour forms the subject of talk.) She formed conclusions that might be wrong, and built up whole theories of character upon them. New to the London world, she entered it with an independent, indomitable spirit of her own; and judged of contemporaries, and especially spied out arrogance or affectation, with extraordinary keenness of vision. She gave me the impression of being a very pure, and lofty, and high-minded person. A great and holy reverence of right and truth seemed to be with her always. Such, in our brief interview, she appeared to me. From ‘The Last Sketch’ by Thackeray, the preface to the Emma fragment found in my volume. Well… I did get accepted to the Dalhousie program. Unfortunately, I cannot afford to go. My mother and I live below the poverty line, and even getting to the school, several provinces away, is not within our means- not to mention housing and tuition. They’ve given me an unfunded offer, which effectively cuts any hope I had of being able to get something worked out to cover the cost. I will be remaining here, then, to continue my work for another year. There are several advantages, although my heart isn’t here… It is very likely that I will be assisting our Victorian specialist with a bibliography on the female gothic which would include Jane Eyre, I imagine. The publisher I am studying with may try to fight her over this- he wants me on his editorial staff. The school is also offering me funding, and I can stay at home. This province also would cover my living expenses if things should go from bad to worse. I …would have prefered a rejection. It looks like we have our young Jane, as well! 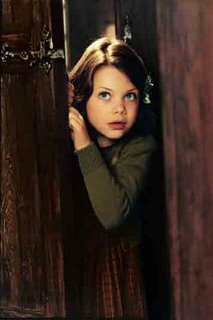 The delightful Georgie Henley (Lucy Pevensie in the latest film version of The Lion, the Witch and the Wardrobe) is going to play Jane in the new BBC production- and, it looks like we can expect a Christmas release! It has been confirmed to me personally by Georgie's management and agency that she will indeed be appearing in a new role: The BBC's (UK), "Jane Eyre" at Christmas time. The website indeed also claims the production will be airing in December. Bronteblog also informs us that the imdb.com page for the production now lists Derbyshire as a filming locale so perhaps the earlier report on filming taking place last week at Haddon Hall is spot on. I was surprised by the casting choice, but not at all displeased! I think she is a talented young actress and resembles Ruth Wilson's rather elfish look. Miss Henley's second Narnia film is also scheduled to come out in December. The picture is from The Lion, the Witch and the Wardrobe. Let me make this clear that this is purely gossip at this point. Someone in Derbyshire writes to say they believe that they witnessed filming of the BBC’s new Jane Eyre this weekend at Haddon Hall. It may well be a baseless rumor, but it does look like an ideal Thornfield, does it not? Described by Simon Jenkins in 1000 Best houses as “the most perfect house to survive from the middle ages”, this remarkable old house is surrounded by terraced Elizabethan gardens and is set amongst the rolling countryside of the Peak District National Park. Haddon has featured in many films and TV programmes including, most recently Pride and Prejudice starring Keira Knightly, Mathew MacFadeyn, and Dame Judy Dench. Should you wish to stay locally we can offer accommodation either at our award winning hotel, The Peacock at Rowsley or in our holiday cottage. I hope you find this site informative and look forward to welcoming you to Haddon Hall. The hall was also used in Franco Zeffirelli’s 1996 Jane Eyre. I have a soft spot for this hall, so I do hope it will be Thornfield again! It was also Prince Humperdink’s castle in The Princess Bride! New Theories of Love? Passion is Passé. Forget Jane Eyre and Rochester, or Heathcliff and Cathy – the emotionally-correct coupling today is Harry Met Sally, only more self-aware. Which is fine when it comes to amicable discussions about work-life balance or avoiding inheritance tax, but quite a few steps removed from the passions that make us human. 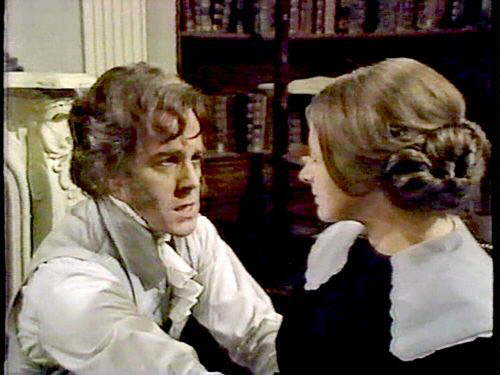 Thanks to Bronteana reader, Liz, we have confirmation that the DVD of the BBC’s 1973 production of Jane Eyre with Sorcha Cusack and Michael Jayston will be available for pre-order from their online store as of next week!